After yesterday’s magical trip to the Taj Mahal, I don’t think anything can beat the morning we had. (Though there’s an elephant ride scheduled for tomorrow, so stay tuned for that!) The visit to the Taj totally exceeded my expectations and has definitely been the highlight of our vacation thus far. Today we left Agra for Jaipur, a vibrant city rich with history and culture. We left the Courtyard Marriott in Agra at 9:30 AM and drove straight to Fatehpur Sikri, an ancient city that Mughal Emperor Akbar built and once ruled in. A UNESCO World Heritage Site, it was constructed in the late 1500s and consists of beautiful mosques, halls and palaces. Akbar built palaces within the city for each of his three wives, and we could see details in each palace that referred to the wives’ hobbies and religious beliefs. 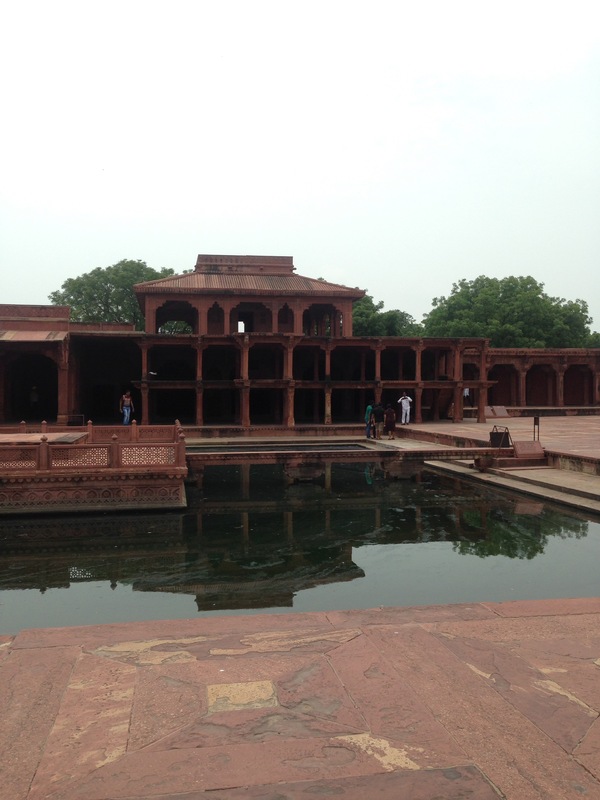 Fatehpur Sikri remains, to this day, one of the finest examples of Mughal architecture in India. Stunning 16th-century architecture and designs! But I forgot the most important part: in order to get to Fatehpur Sikri, we rode on a cramped, run-down local bus up a hill in 34 degrees Celsius and a humidity factor of 89%! (It was honestly as bad as it sounds.) Now, keep in mind that my parents and I try not to be snobs when we’re travelling. Despite staying at nice hotels and taking precautions to ensure our safety, we mingle with locals whenever possible and find it fun to live like them for a day. The problem with today’s mingling was that it was a sweaty, smelly mess that left me desperate for a refreshing shower. 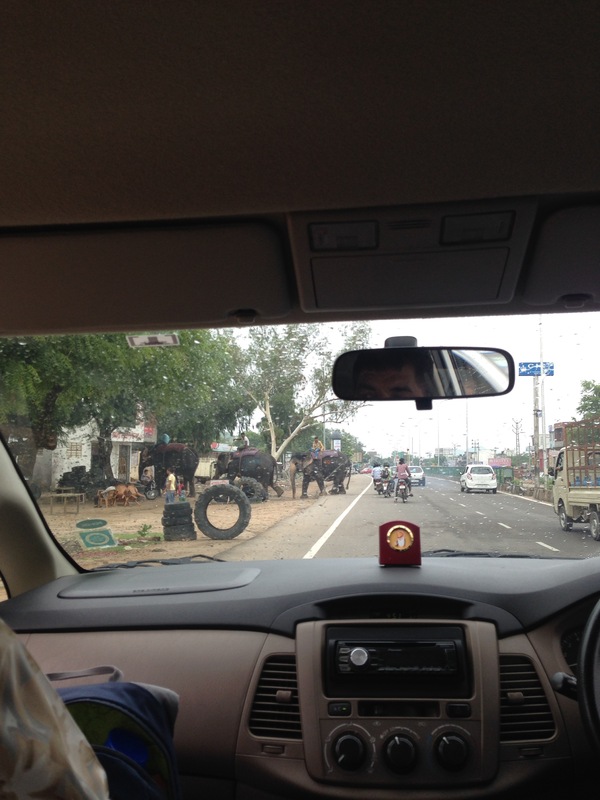 Upon arrival at Fatehpur, we were a little disappointed to learn that we couldn’t take our car up to the ruins and would instead have to take the local bus, a small, ancient-looking vehicle that carried 25-30 people. My mum and I were a bit hesitant to get on when we saw that we were the only foreigners, but there was no other option. We squeezed into some tiny seats and received a mix of glares and curious looks from almost everyone on the bus. I started to feel like a goldfish – for some reason, people stared at us as if we were their entertainment. Maybe they were trying to figure out if we were Indian and, if we were, why we were dressed so differently than them. Everyone on the bus was dripping with sweat and wiping their faces with their clothes. Sweaty toddlers sitting on their parents’ laps had hair plastered to their foreheads and we saw more than one person with a totally soaked shirt…the humidity was truly overwhelming and I missed a fair bit of what the local guide was saying due to feeling very lightheaded. An hour later, one bus pulled up in front of a crowd of 60 people and there was immediate shoving and shouting as people scrambled to get a seat. We’re talking actual shoving – many of the people already climbing on to the bus were grabbed at until they had to give up and let others take their place. I was trying to stand still but ended up getting pushed and yelled at anyway. I think Fatehpur would’ve had more meaning for me if we had had a more pleasant method of transportation, but hey, at least we can say we took an authentic Indian bus ride and survived. We arrived at Le Meridien hotel in Jaipur in the evening and didn’t get to see much of the city (although we did see elephants! ), so tomorrow will be a full day of sightseeing. Can’t wait! It took 14 hours to get from Toronto to Delhi, but that was truly one of the most comfortable flights I’ve ever had. We flew direct with Air Canada in Premium Economy, which means more legroom, better meals, wider seats and a much cozier cabin than regular economy. There were only 3 rows (21 seats), which meant we were able to sleep in a very quiet, dimly lit cabin with minimal disruptions from people walking up and down the aisles. I definitely recommend Premium for a great experience on long-haul flights. The food was surprisingly good (the butter chicken, rice pudding and samosas were a real treat) and there was hardly any turbulence – well done, Air Canada! This show, now in its fourth season, is so addictive! Consider yourself warned. Source: http://www.amazon.ca. Guys, if you aren’t watching Orange Is the New Black, you’re seriously missing out! I think many people assume that shows about prison are depressing, and while Orange certainly has its bleak moments, it’s also light-hearted, clever and very entertaining. Based on American ex-felon Piper Kerman’s memoir detailing her year in a federal prison, this award-winning Netflix show follows a character named Piper Chapman (played by Taylor Schilling) as she learns how to survive amongst hardened criminals and adapt to her scary, unfamiliar surroundings. An educated blonde woman from Connecticut, she fell in with with the wrong crowd in her 20s and was charged 10 years later for knowingly transporting a suitcase full of drug money – also known as money-laundering – across international borders. The character’s uneventful and seemingly innocent life story is probably what makes her so relatable to the audience; other characters often comment that a “nice, white lady” like Chapman doesn’t belong in prison. With each Orange episode we find out more about the (often shocking) backgrounds of the other characters, which helps us understand more about where they come from and how they landed in prison.